Libraries increasingly define themselves as educational and meeting centres. One important element is architecture – which sometimes calls for climbing in hiking boots! The wish that public libraries should not only be used as lending stations, but also as cultural centres for citizens of all ages and educational levels, is today shaping the discussion about how libraries should be designed from an architectural point of view. "Libraries only have no future if they are seen as book warehouses," says Dutch architect Francine Houben in “Ex Libris”, the current documentary about the New York Public Library. The highly acclaimed documentary by filmmaker Frederik Wiseman shows what this means in practice. One sees lectures and readings with Ta-Nehisi Coates, Patti Smith or Elvis Costello. Classical concerts. Dance groups for older citizens. Computer courses for children. And time and time again, old and new rooms as oases of peace and consumption-free places to linger for all New Yorkers - whether professors preparing their courses or homeless people seeking shelter. The New York Public Library is a haven of living democracy. 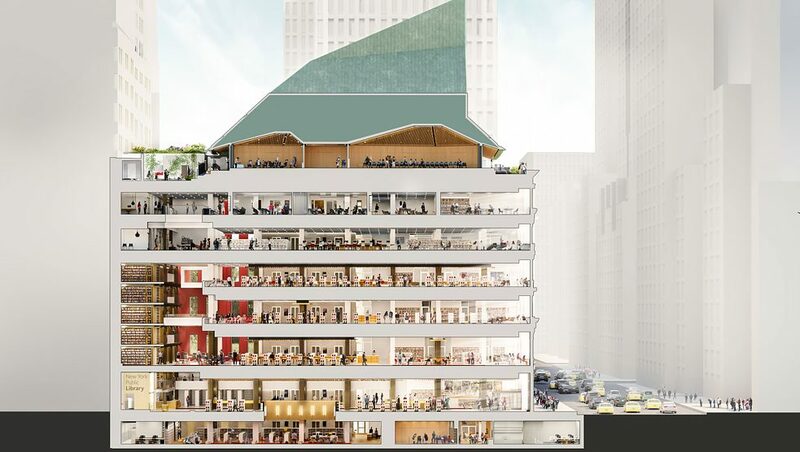 Accordingly, Francine Houben, together with Mecanoo, the architectural firm she founded, has placed people at the centre of her designs for the current renovation of the Midtown-Manhattan Library, which she is directing. Opened in the 1970s in a building originally conceived as a department store, Midtown is to represent the rejuvenated new library system starting in 2020. While the "Long Room" features multi-storey shelving for classic browsing, an entire floor is designated for acquiring professional skills, while other floors will be furnished for children and teenagers. The only freely accessible public roof terrace in Manhattan is literally the crowning achievement of the entire building. However, motivations for renovating or building new libraries vary. The construction of the Dutch library "Chocoladefabriek" was simply for financial reasons. The municipality of Gouda decided to reduce subsidies for libraries by 30 percent. Instead of restricting services or abandoning individual branches, they agreed to close all branches and move to a building on the outskirts of the city - a former chocolate factory. Along with the library, the regional archive, a printing workshop and a Grand Café also moved their headquarters to the old industrial building. 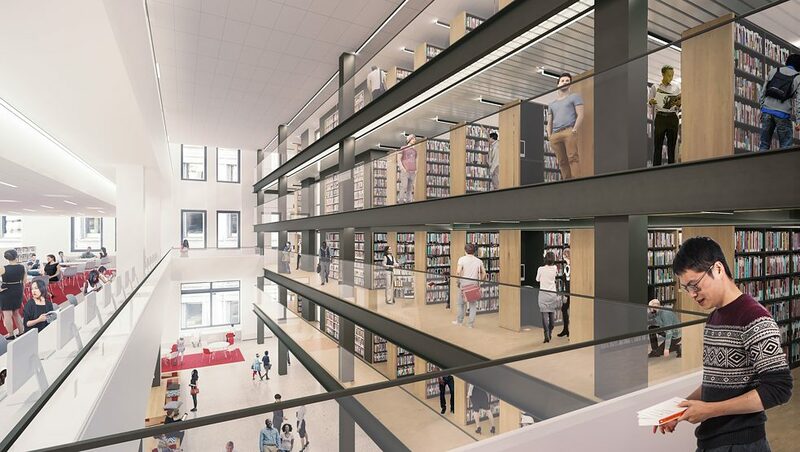 Design for the new Midtown-Manhattan Library in New York, USA. The renovation is scheduled for completion in 2020. With about 1.7 million visitors per year, it is the busiest branch of the New York Public Library. 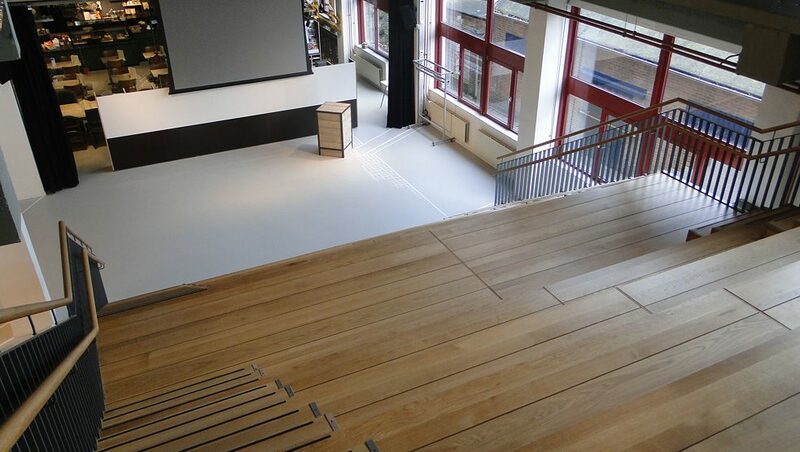 The large wooden staircase in the Chocoladenfabriek in Gouda, Netherlands, often doubles as a spectator's platform at events. 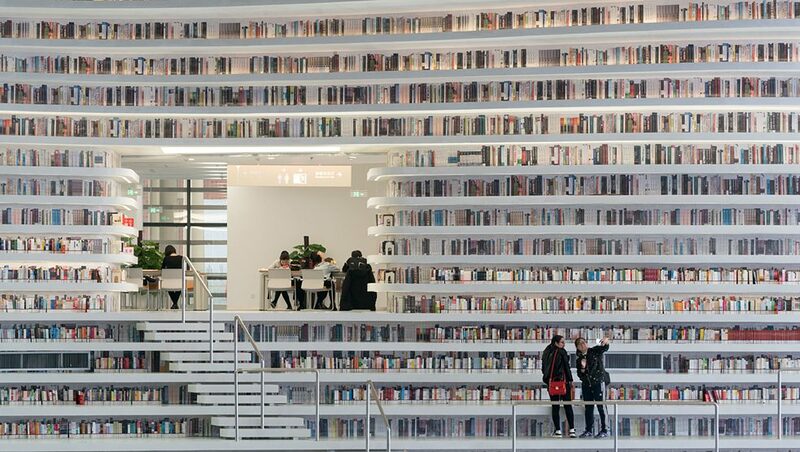 Since its opening, the Tianjin Library has also been a popular tourist attraction with up to 18,000 visitors on weekends. Looking from the outside into the atrium with its decorative sphere reveals why the building has been nicknamed "Eye". They have been using the chocolate factory together since February 2014. With the collaboration of independent library consultant Rob Bruijnzeels and the "Ministry of Imagination" associated with him, a venue for social interaction was created. Instead of the usual 70 percent, bookshelves here occupy only 30 percent of the available space. It was important to the creators that there be enough space for working with the collection and for the second task of creating knowledge. And this is the motto of the Chocoladenfabriek: "Komm kennis maken!" which in Dutch means both "Come, let’s get to know each other" and "Come and create knowledge". 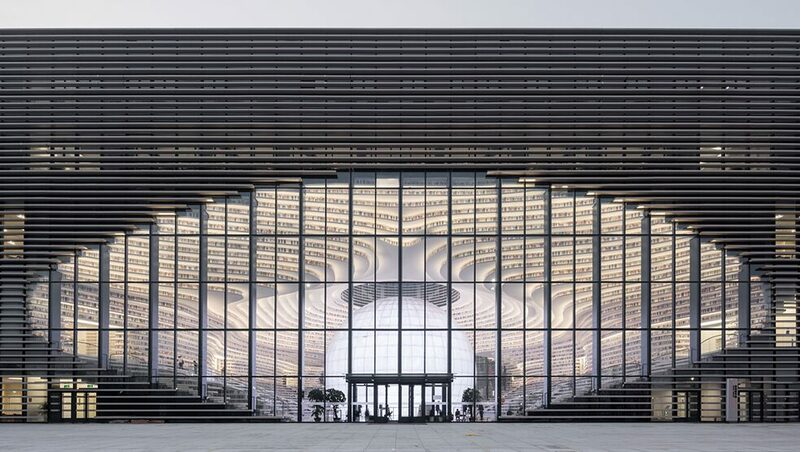 The Tianjin Binhai Library in north-eastern China, which opened in October 2017, is particularly impressive from an architectural point of view. Together with the local Tianjin Urban Planning and Design Institute (TUPDI), the Dutch architecture firm MVRDV implemented the objective of creating a new highlight for the planned cultural centre in Binhai, an industrial suburb of the port city of Tianjin, in just three years. The library has a total floor space of 33,700 square meters and accommodates 1.2 million books. In the first week alone, about 10,000 people came daily to visit the spectacular building with its terraced shelves. The heart of the building is the auditorium. However, the "Book Mountain" is not accessible to all visitors - according to the library, readers under the age of 14, visitors in high-heels or those who are not fit to hike uphill should avoid the steep shelves as much as possible. The top shelves could not be made accessible at all due to the tight construction schedule, they only contain aluminium plates instead of books. Also in the atrium many bookshelves were equipped only with photos of book spines. Reading is done in the more traditional sections of the library. These three examples, New York, Gouda and Tianjin, show how diverse the self-imposed task of converting libraries into educational and meeting places can be. None of these places has anything in common with mere warehouses. Samira Lazarovic is a freelance journalist and author. She works for the online editorial department of n-tv and other media. Copyright: Text: Goethe-Institut, Samira Lazarovic. This work is licensed under a Creative Commons Attribution – Share Alike 3.0 Germany license. Back to the dossier "Future Libraries"